on a recent visit with my parents, I learned my fondness for photography doesn't just go back to my father. my dad said that his father, my adored grandpap, was also quite the shutterbug in his younger days. as with my father and myself, grandpap loved documenting his everyday world. unfortunately this early avocation was curtailed once he married and he and grandmam needed to direct their attention and resources to the care and feeding of a large family. the picture above is of grandpap's sister, emma. I love the way he captures her playful nature and don't you just love the dress. like most photos in my 'treasure box' of old family photos, there is no date on the back, but at least now I know who was most likely the photographer of many of these older photos. speaking of grandfathers, march 11 is the anniversary of the death of my other much loved grandfather - george kravitz. from this grandfather I'm sure I inherited my fondness for making things and hearing and learning about how things work. grandfather george died in 1965 - way too young. he died when my family was living in guam. one of the most profound memories I have from childhood was watching my mother's inconsolable grief; she was not able to say goodbye and distance made it impossible for her to return to pennsylvania for his funeral. 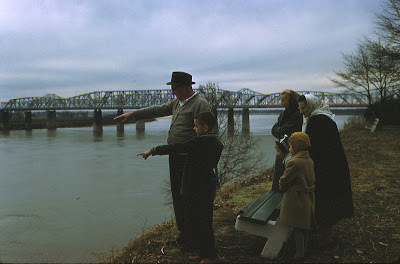 this picture below was taken when my grandparents came to visit us in 1962 while we were living in memphis. I've always wondered what my grandfather and brother are pointing at. my father took this picture and I love the way he framed the picture and captures the moment. others in the photo include my mother, nana, my cousin mary (in rust colored hat), and myself. The photos are great. I am a little curious about the locations. I think when doing your family tree, notes and photos about the individuals are so important. I have a poem my great great grandfather wrote about going to Station Island in Lough Derg--One poem seems to capture his whole way of looking at life, his spiritual side and love for life. Sadly I don't have many photos. thanks ms w for the reminder. I usually include that info (if I have it) in my posts. this morning I was in a hurry. Nice post--I love these old family photo posts so much! 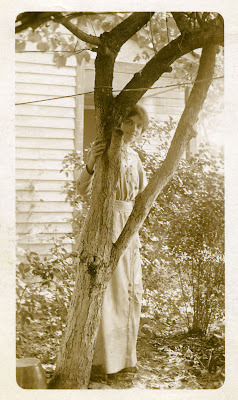 beautiful use of the tree as a frame for the woman. I love the photo of Emma. Pictures like these always make me want to know more about the subjects. 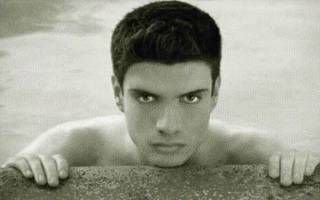 I love these old photos. I recently was given a load of old family photos that I've been putting on computer so I can send to the rest of my family. But, why oh why, didn't they put dates and names on the back?! Because most of us don't. I have some interesting photos but I don't know if it's great grandma Bessie or the woman next door. I have a spot in my heart for my paternal grandfather, who passed some four years ago I believe in his 80s. He was an amazingly intelligent man and very well-spoken, and a great link to my Hispanic roots, which sadly died with him. Yes, at least we were fortunate to get to know them, since many people don't even get to know theirs. Thought I'd come and look at some older posts- I don't quite mean that March 11th is resigned to the past now but I'm sure you know what I mean!